The cooling capacity will determine how much IT equipment you can cool inside your cabinet. Power availability at your facility will also determine the amount of cooling. Using standard everyday 115 volts, will provide 13,000 Btu/hr of cooling. While using higher specialty 208-230 volts, will provide higher cooling capacities. Cool air needs to be directed to the front of the IT equipment installed in the cabinet per the American Society of Heating, Refrigeration, and Air Conditioner Engineers (ASHRAE). The IT equipment draws in the cool air from the front, and cools down the internal electronic components while exhausting warm air out the back of the cabinet. Cooling the area in front of the IT servers instead of the entire room is the most efficient way to cool down IT networks. Providing a blanket of cold air in front of the servers will allow the cabinet to cool down more IT equipment using less energy. Creating a cold aisle of supply air in front of the computer servers, and a hot aisle in back of the cabinet is the most efficient way to cool your network. If the cabinet is installed in an office, the warm air exhaust will need to be vented out of the room. Typically this is done by ducting the warm air into the plenum space above the drop ceiling. Choosing an air conditioned cabinet with a powerful fan motor to remove this warm exhaust air will improve cooling reliability and efficiency, while simplifying and reducing installation costs. Certain air conditioned cabinets will require inline fans to remove the warm exhaust air from the room. The extra mechanical fan adds another point of failure to the air conditioner, while increasing the overall energy the cabinet will consume. Using an electronic thermostat to control the temperature inside the air conditioned computer cabinet allows the IT manager to quickly and reliably control the environment for the IT network. The thermostat should be located in the front of the servers to accurately measure the critical incoming server temperatures. The air conditioned computer cabinet should be able to operate down to 65°F to properly cool down network servers. Cold supply temperatures reaching down to 45°F, provides flexibility with computer room cooling while creating the perfect environment for your IT equipment. An air conditioned computer cabinet will replace a data center’s infrastructure, therefore make sure the cabinet will connect to the building management system. The central building management system will provide a central location to shut-down the air conditioner in the event of a fire, or the air conditioner can provide warning signals / audible alarms in case of a malfunction to prevent IT equipment from overheating. Ideally the air conditioned computer cabinet will include a form of Data Center Information Management (DCIM) to allow personnel to centrally monitor temperatures within the cabinet. This is critical, especially when the cabinet is located in a remote server room. The monitoring system will send email alerts when the temperatures exceed alarm set point, or be able to provide daily status emails with high, low, and average temperatures. All air conditioners remove moisture from the air, and there are very few options on what to do with this condensate. The best option is for the air conditioned cabinet to include a condensate pump to deliver the condensate to a nearby drain, sink, or water line for continuous operation. Having a condensate pump allows the air conditioned cabinet to control proper humidity levels even in the most humid locations to ensure 7/24/365 operation. All pumps should have a safety switch to prevent water damage during pump failure. Air conditioned computer cabinets that re-evaporates the condensate into the warm exhaust air will cause poor indoor air quality. Instead of properly disposes of the condensate some cabinets will fling the condensate onto the hot condenser heat exchanger, this will evaporate into the warm exhaust air out of the cabinet. If the cabinet is located into an office, this hot moist air will be blown up into the drop ceiling plenum space. The moist warm air above the drop ceiling will be the perfect environment for mold growth. If the computer cabinet is located in a warehouse, the hot moist air will be detrimental to the people and equipment working in this space. Air conditioned computer cabinets that re-evaporates the condensate is typically undersized in humid conditions. If the cabinet door is ajar the air conditioned can easily be overloaded by the humidity in as little as 5 minutes. This could lead to water leaking from the cabinet, because it cannot evaporate the condensate into the warm air fast enough. All air conditioned computer cabinets need to have a contingency plan in case of mechanical failure of the air conditioner. If IT servers are confined inside a cabinet, temperatures will rise quickly to dangerous levels that will cause damage immediately. At the minimum the computer equipment will need to get fresh air to the front of the cabinet to prevent the recirculation of the hot inside air. 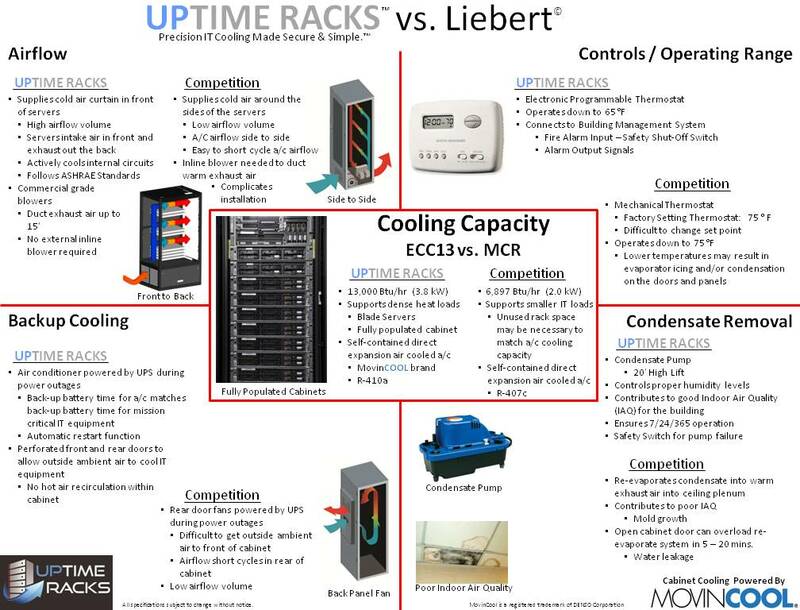 For mission critical networks that have a back-up UPS, a UPS matched for the air conditioner will prevent any unnecessary shutdowns due to elevated temperatures. All computer room grade air conditioners must have an automatic restart function to restore proper cooling once the power is on again.